jossie literally planned her birthday party for an entire year. right after her party last year (which was barbie themed), joss decided that she wanted to have a jasmine party. when she told me that a year ago i laughed and assumed she would forget about it by the time her next birthday came around, but she made it happen. well really, angela made it happen. this was joss's sixth birthday party and it was awesome, i would have died to go to a party just like it when i was six! joss obviously had to have a killer dress for her party. angela found this one on the chasing fireflies website, and it literally could not have been more perfect. 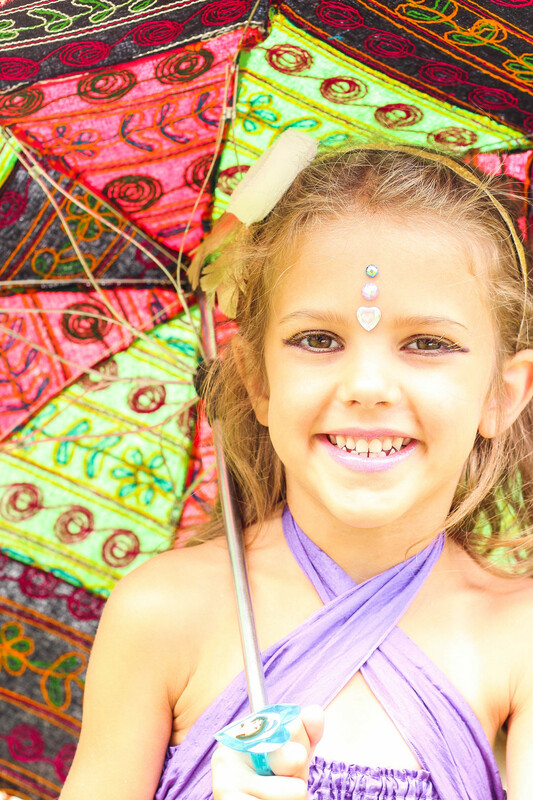 she also had the headband made with gold feathers, and flower and a large purple jewel- just like jasmine's necklace! 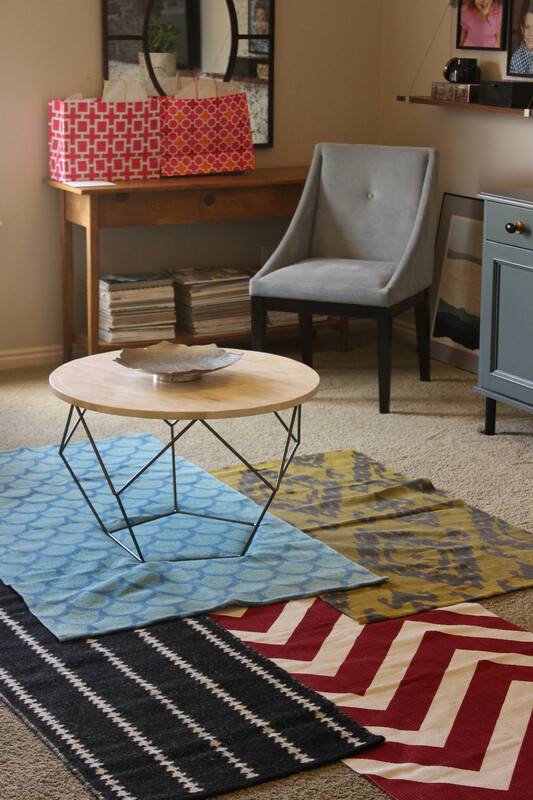 angela decorated the front room with layered rugs, and hung exotic umbrellas (from here) and paper flowers from the ceiling. 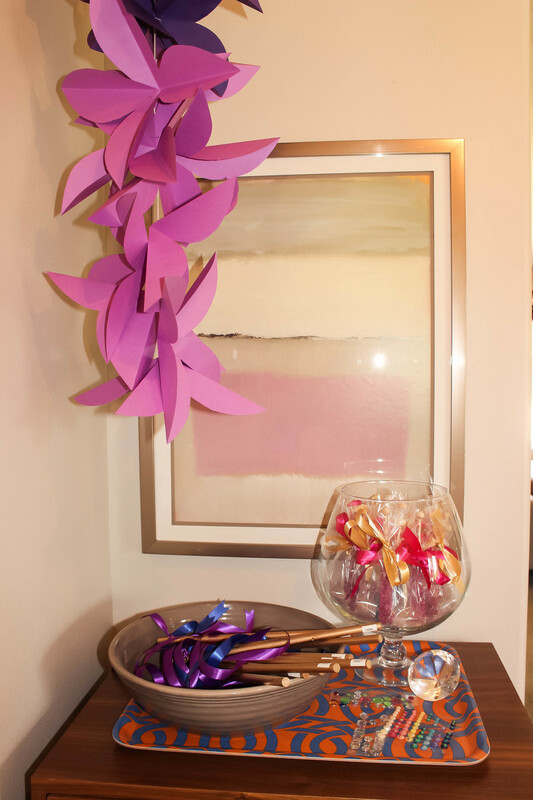 we made the paper flowers, copied from ones we saw at west elm- they were actually pretty easy, but used tons more paper that we expected. 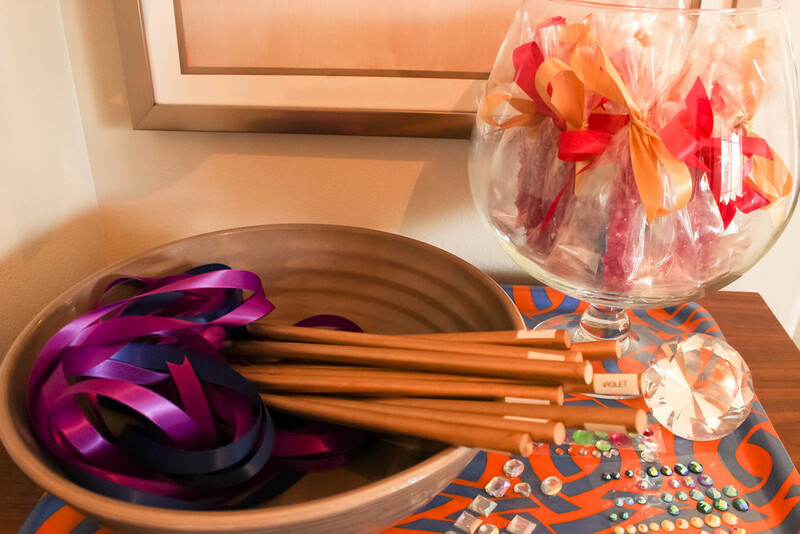 in the entryway she had the favors for the kids- rock candy lollipops and ribbon wands. she also had jewels for each of the kids. angela went simple on the food since it was a post-lunch party. there were pretzel sticks, grapes and cheese cubes, and rolos. 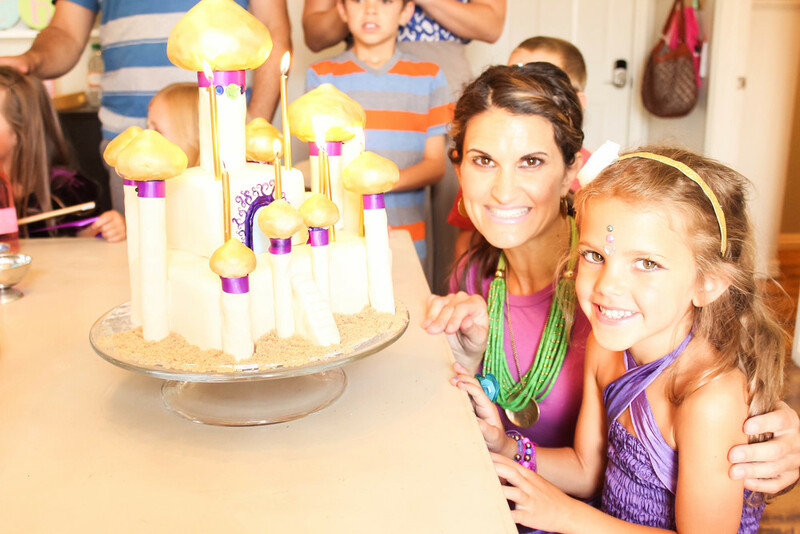 she went all out on the cake, and asked her lady to create jasmine's palace! 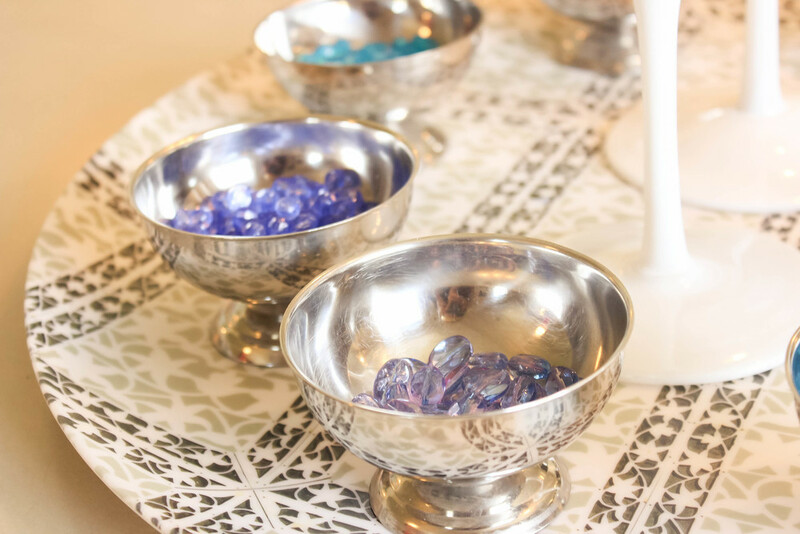 the table was set with a station for the girls to make beaded bracelets while they ate their snacks.i love all of the little details like the drink labels and colorful ribbons, they help to tie everything together. 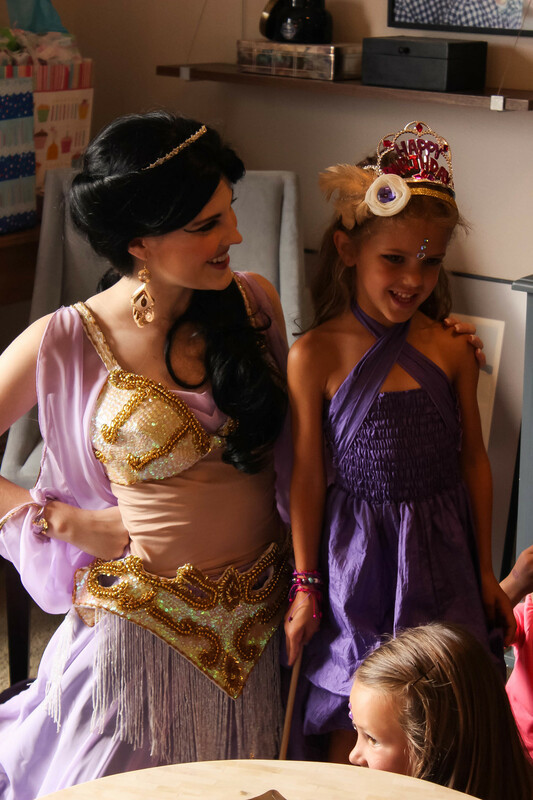 the girls were surprised by a special guest- princess jasmine actually came to the party! she sang to the kids and taught them how to be princesses- and she did not break character once! all-in-all the party was a hit, i just wish i could have had one like it when i was little (which is not to say that my winnie-the-pooh and hula parties were not awesome! ).